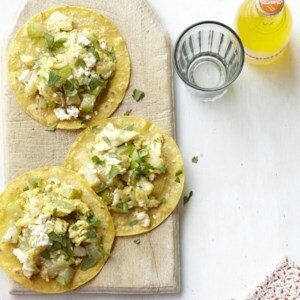 Find healthy, delicious Mexican breakfast recipes, from the food and nutrition experts at EatingWell. 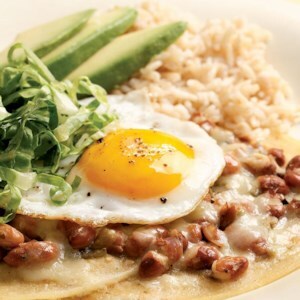 Huevos rancheros or “ranch eggs” is a classic Mexican dish that is great for a quick dinner. Traditionally, it's made with a red tomato-based sauce. Here we use tart and tangy green salsa instead. 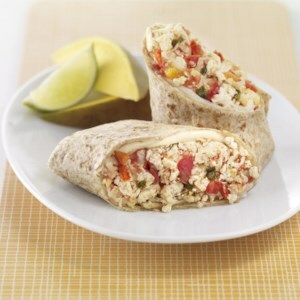 Serve with: brown rice and slices of avocado. 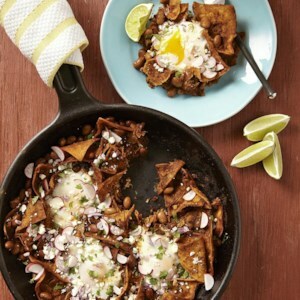 This Mexican chilaquiles recipe is a one-skillet dish made with corn tortillas and eggs. Making chilaquiles is a great way to use stale tortillas, as they are crisped in the oven before being simmered in a flavorful garlicky sauce. Unless you want a very spicy sauce, make sure to use regular (not hot) chili powder. 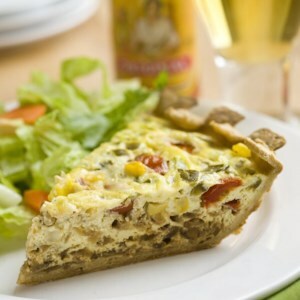 This healthy quiche recipe is perfect for entertaining--the quiche can be made ahead and is just as flavorful served warm or at room temperature. 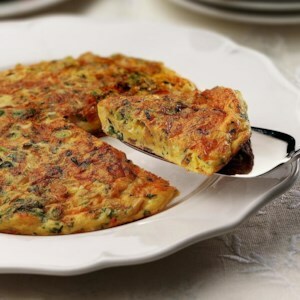 Filled with cherry tomatoes, pickled jalapeños, Jack cheese and caramelized onions, this healthy quiche with a whole-grain crust is perfect for breakfast or brunch, or served with a light salad for lunch. 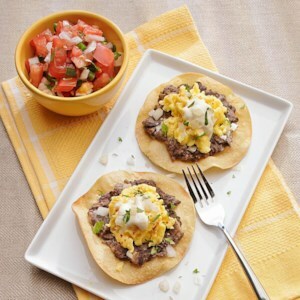 If you love breakfast burritos or huevos rancheros, you'll love this tostada with seasoned black beans on crispy tortillas with scrambled eggs on top. Pass salsa or hot sauce to go with it. 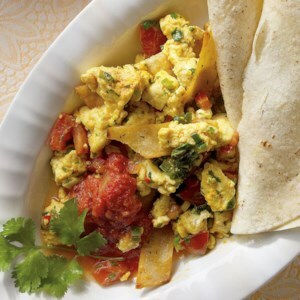 Crumbled soft tofu is often used to make satisfying, egg-free scrambles so it's a natural for a vegan interpretation of migas, a traditional Tex-Mex dish made with eggs and strips of corn tortillas. In this version, fresh chiles, chipotle and cilantro balance the neutrality of the tofu. Serve with a side of black beans. 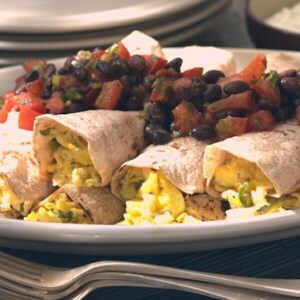 This protein-packed Southwestern egg burrito recipe is always a hit, whether you're serving it for breakfast, brunch, lunch or a casual dinner. 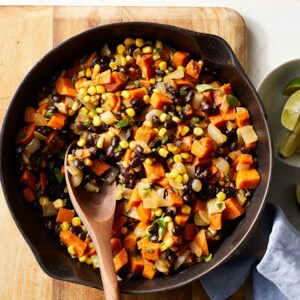 The homemade black bean salsa recipe adds a special touch and takes just 10 minutes, but you can also use your favorite prepared salsa to make this faster. 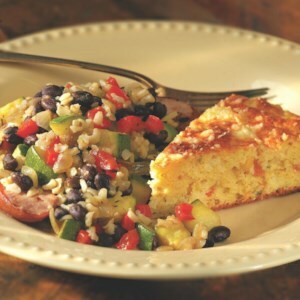 As the name implies, this dish makes a breakfast suitable for any cowboy, but for those with a less physically demanding occupation, it is perfect for brunch or a simple dinner.